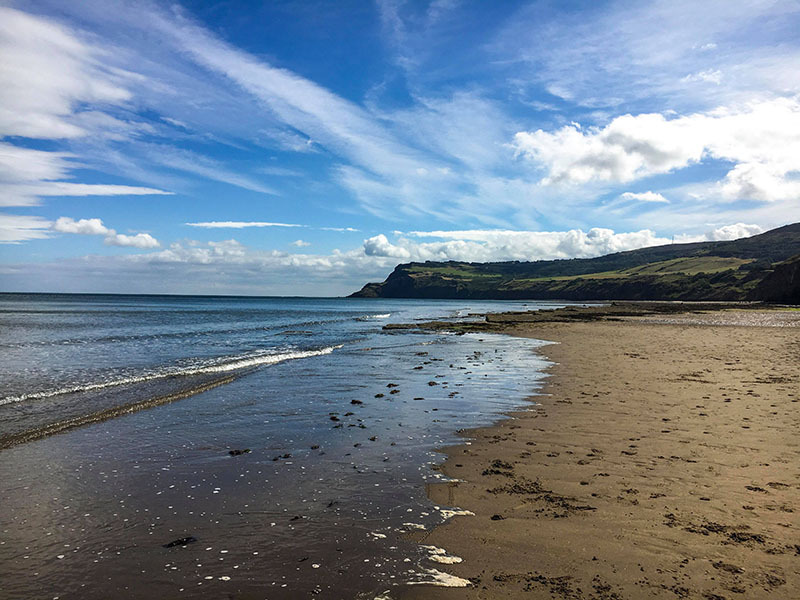 The picturesque scenes of Whitby are guaranteed to entice every visitor to Yorkshire’s beautiful seaside town, and today Chloe from Jandals and Sandals is sharing her Whitby travel guide. Fish and chips, winding backstreets and crab fishing. These are just a few of the things that come to mind when I think of Whitby. 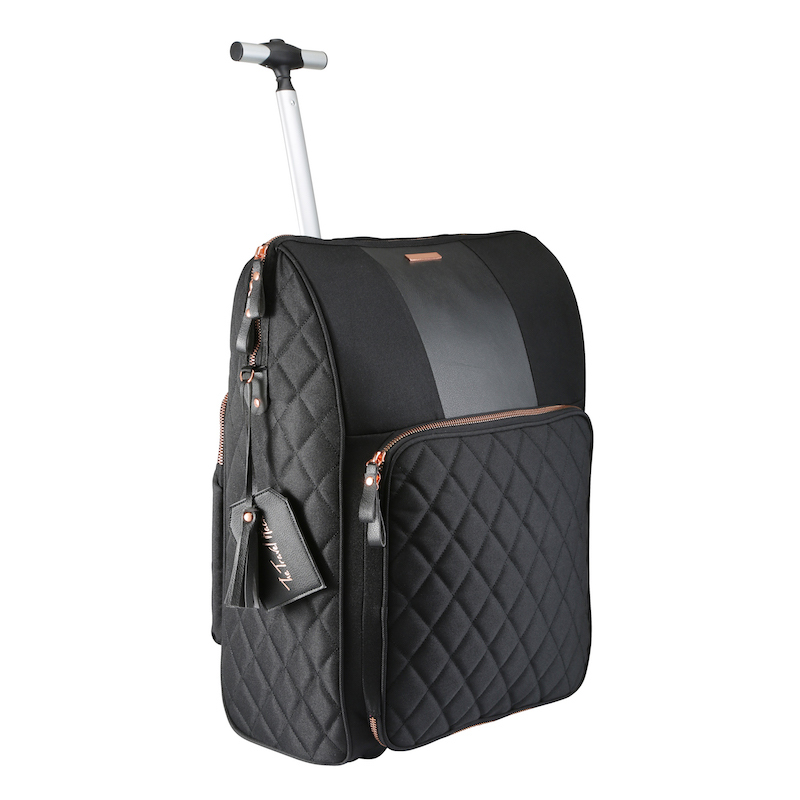 Tucked on the North East coast of Yorkshire, Whitby conjures up all sorts of memories from childhood holidays to the seaside. 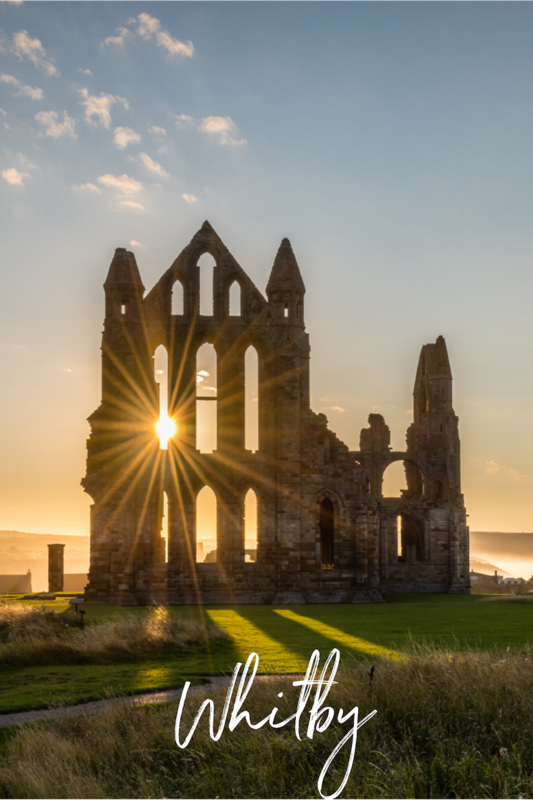 Having recently returned to Whitby after 11 years, I was now able to truly appreciate the beauty and history of this seaside town and create this Whitby travel guide. 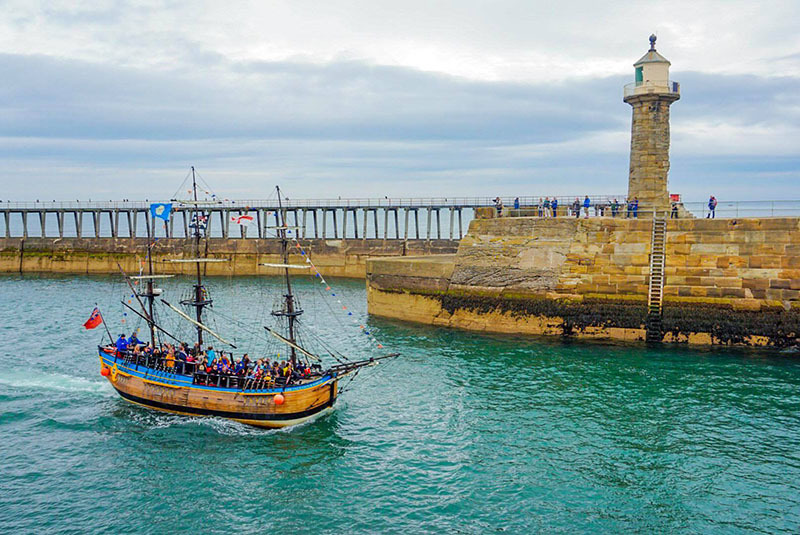 As a fishing port, Whitby was once a prime location for smuggling and there are many tales – from John Andrew ‘The King of Smugglers’ to Captain Harold Hutchinson – using hidden tunnels to bring illegal and untaxed goods in from the harbour. All very juicy stuff! Nowadays, Whitby walks on the legal side of things and exudes the sort of peacefulness only certain seaside towns can claim. Here’s my Whitby travel guide sharing some of my favourite things to see and do and the best places to eat and drink in Whitby. The first thing on any Whitby travel guide should be Whitby Abbey. Instantly recognisable to everyone who visits Whitby, the abbey sits on a cliff above the town for all to see. Looking up at the ruins it was easy to see how and where Bram Stoker got his inspiration for his supernatural tale. Aside from the gothic ruins, there’s a panoramic view of Whitby sitting peacefully below the cliff, juxtaposed with the crashing waves of the sea. Set sail around the Whitby Harbour and along the coast to Sandsend. The traditional sea shanties ring around your ears as the authentic replica of HMS Endeavour glides along the sea. The original expedition with Captain Cook saw him reach the new and exotic sights of Cape Horn and Tahiti, cataloguing thousands of new plants, birds and animals. Captain Cook even claimed possession of Eastern Australia along the way, before finally returning to England with his discoveries. This Whitby travel guide would not be complete without a mention of Dracula! Turn back the time and step into 1914 to discover British military and social history, starting at the beginning of World War I. Based in the grounds of an original World War II Prisoner of War Camp, a visit to the Eden Museum will give you a unique insight into the dark past of not only Britain but also the POW which could hold over 1,000 prisoners at any time. Though I didn’t visit the museum on my most recent visit, I can still remember walking around the tanks that take pride of place outside the huts and mess halls on a trip when I was around 12 years old. Definitely worth a trip if you have children. Fish and chip lovers unite. The Magpie is THE place to go in Whitby for a quintessentially British seaside meal. Originally built in 1750 as a merchant’s house, up until The Magpie began calling it home, the building was used for many purposes, including a shipping office and as a spot where pilots would wait for orders to bring vessels into the harbour. Expect dozens of restaurants to be vying for your attention, but The Magpie really is a classic. The distinctive black and white building overlooks the harbour and since 1939 they’ve been serving up massive portions of a huge variety of fish straight from the sea. Make sure you book ahead or try to bag a table earlier on in the day, as there will be queues. Yep, it’s that good. Head over to Rusty Shears Tea Room, tucked away down a quaint alley just off Silver Street – the shopping hub of Whitby, for some tea and cake in a truly vintage setting. Though if tea isn’t your jam, fear not, as there are over 30 unusual flavours of gin to choose from if you prefer an afternoon tipple with more of a kick. On Church Street near the historic Market Place, The Black Horse Inn is one of the oldest public serving bars in Europe. Since the 16th Century, The Black Horse Inn has also been used as a funeral director house, a spirit warehouse and even a brothel. Now, the pub offers a fab choice of real ales in the heart of Whitby’s old town. The Blitz steps back in time to the 1940’s, with breakfast, lunch, cocktails, cake and even tapas on the menu. It’s simply spiffing. As part of the Dinosaur Coast, Robin Hood’s Bay lured me in with its curving coastline and steep narrow lanes winding down to the beach. Huge white rock piles line the edge of the beach – a perfect spot to perch on whilst people watching the crab fishers. 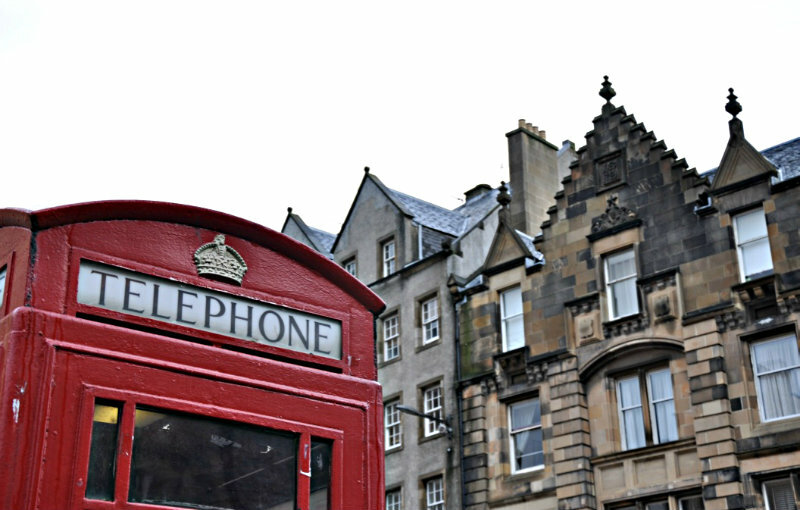 There’s even an award-winning ghost walk guiding willing visitors down narrow streets and alleyways come dark, all whilst telling spooky supernatural tales. Having received rave online reviews, I’d put my money on this being well worth the scare. TV fans get ready; those who are familiar with the British series Heartbeat will find Goathland a familiar sight. Known as Aidensfield in the series, the town has had its fair share of the limelight, also featuring in Harry Potter when the heritage station was used as Hogsmeade station in the films. Distinctive red roof cottages are scattered throughout the charming bay, and it’s often given the title of the Yorkshire Coast’s prettiest destination (though Robin Hood’s Bay still wins that accolade for me). Popular for rock pooling and fossil hunting, Runswick Bay is a cool way to spend a morning near Whitby. 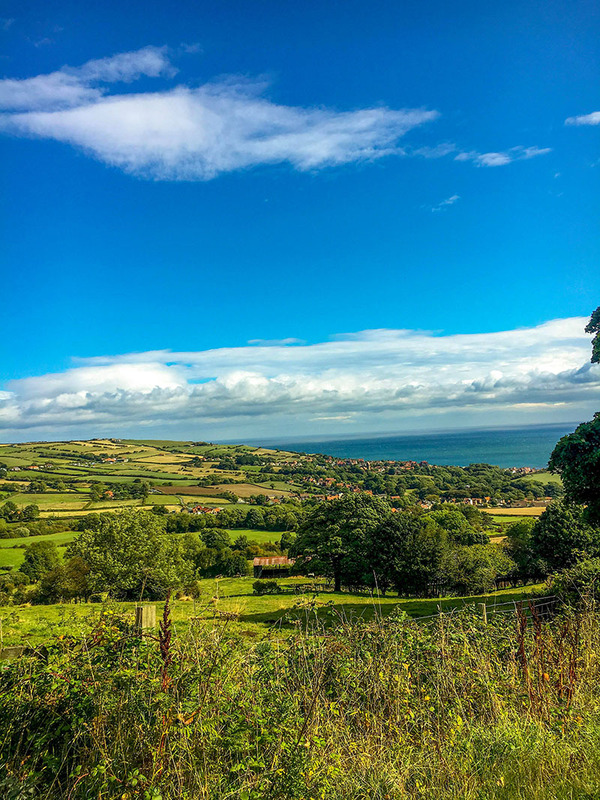 Away from the beaches in Whitby and nearby, Glaisdale brings the greenery and is nestled in the hillsides by the Esk Valley Railway – running from Whitby to Middlesbrough. Pork pies are well known in this small village (winner winner) though there are many butchers all claiming to have the “best” in North Yorkshire. Walkers often venture into Glaisdale, as Wainwright’s famous Coast to Coast walk runs right through Glaisdale. Tell me someone from the North who has never heard of Scarborough and I’ll be shocked. Known as a classic seaside destination, Scarborough has been THE beach town for so many people for decades. Scarborough Castle has over 2,500 years of rocky history behind it as a former medieval fortress overlooking the North Sea. 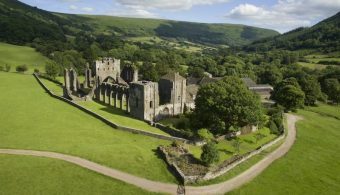 Back in its prime, the castle was developed by Henry II and King John, and had a front row seat to the action of many brutal battles. Now, the excavated site is home to many artefacts which have since been discovered, from prehistoric pottery to Bronze Age swords. 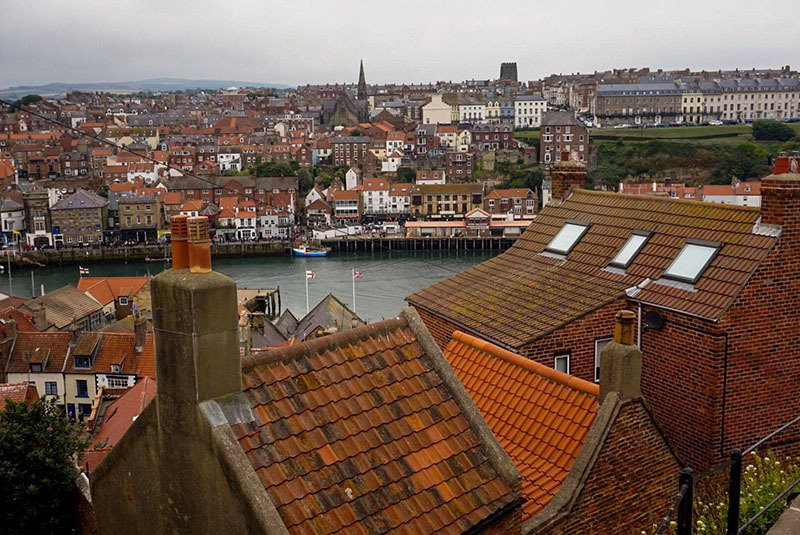 There are loads of trains coming in and out of Whitby each day so it should be relatively easy for you to find your way to this dreamy coastal town. Massive thanks to Chloe for her fab Whitby travel guide! Chloe is the travel blogger behind Jandals and Sandals, searching for the best in travel and adventure. With a keen eye for photography and a platform for storytelling, Chloe shares the ups and downs of each destination and activity with an honest truth. Travelling is something always previously been reserved for annual leave and bank holiday weekends, but with a one-way ticket to Bangkok booked for January 2019, Chloe will be taking Jandals and Sandals on the road full-time. Alongside the blog, Chloe will be documenting the adventures as they unfold on Instagram. Wow, such a beautiful place! Thanks for sharing! I am already imagining myself travelling there soon, Monica! The place looks amazing, and very vintage-looking too. I can’t wait to set foot to Whitby Abbey and Eden Camp Museum! Already having thoughts of booking a trip to Whitby! Cannot wait to go there soon.